Your Mother Of The Bride/Occasion Wear is cleaned using our specially Developed Baptiste Process®. It is then steamed and packed into a beautiful hand made acid-free box in a design of your choice, protected with layers of acid-free tissue. This will protect your garmnts from dust and light and prevent discolouration. Please select a box design from the swatches below (a larger preview will appear in the image window). There are also options for calligraphy personalisation with this item. 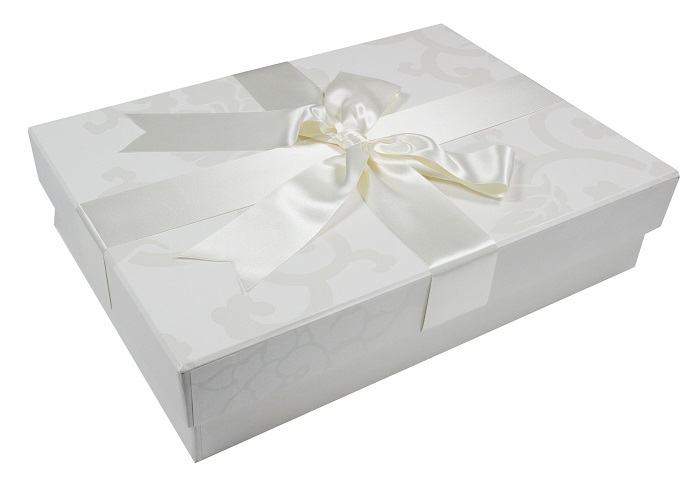 You have the option of personalising your box by adding a hand written message. PLEASE NOTE: 29 characters per line (inc spaces) and a maximum of 3 lines. Just type your personal message in the box below then click Add to Basket. Your new total cost will be displayed. If you do not require a calligraphy service, just leave the text box blank. If everything is correct, complete your box order by clicking Add to Basket. Your Mother Of The Bride/Occasion Wear is cleaned using our specially Developed Baptiste Process®. It is then steamed and packed into a beautiful hand made acid-free box in a design of your choice, protected with layers of acid-free tissue. This will protect your gown from dust and light and prevent discolouration. Terrington Burchett Ltd are the ONLY Company who use the unique Baptiste Process®. It is our process and not just simply ‘a name’. If the Baptiste Process® is simply a name then why can we clean beads, sequins etc... where most others cleaning companies can not. Please be aware of other companies claiming to use the Baptiste Process® as these are false claims. Baptiste Process® is a registered trademark of Terrington Burchett Ltd.